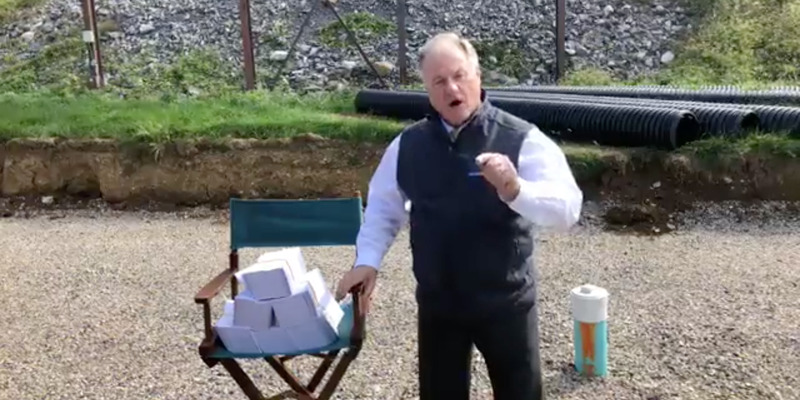 Screenshot via Scott Wagner/FacebookRepublican GOP gubernatorial candidate Scott Wagner told his opponent, Democratic incumbent Tom Wolf, to ‘put a catcher’s mask on your face because I’m going to stomp all over your face with golf spikes’ in a Friday video. Wagner made that remark in a video posted on Wagner’s Facebook page on Friday. He accused Wolf of being behind a website and series of billboards accusing Wagner’s trash-hauling company of “strong-arming” customers. An advocacy group unrelated to Wolf’s campaign paid for the billboards. The video was later removed. In the video, Wagner accused Wolf of being behind a series of billboards posted around the state reading “Scott Wagner’s Penn Waste sued 6,979 Pennsylvanians. Find out why,” encouraging them to visit PennWasteAlert.com for more information. An advocacy group unrelated to Wolf’s campaign paid for the billboards. The video showing Wagner’s threat was later made unavailable on Facebook. The website accuses Wagner and his company, trash hauling firm Penn Waste, of conducting anti-competitive business practices by bullying government officials for contracts, violating state environmental regulations, and suing customers over late and unpaid bills, with a lawsuit against the company alleging Penn Waste dispatched sheriffs to people’s houses and mistakenly sued people for nonpayment when they had never used Penn Waste’s services. In the video, Wagner did not directly deny PA Spotlight’s allegations. He defended his practice of suing nonpaying customers, touted his record of creating jobs in Pennsylvania, and attacked Wolf’s intelligence. “You don’t know the difference between revenue and bottom line,” he said, addressing Gov. Wolf, who formerly served as a business executive and as Pennsylvania’s secretary of revenue. “Scott Wagner’s latest rant shows he is unhinged and unfit for office,” Wolf’s campaign said in a statement addressing the video. Wolf is favoured to win reelection to the governor’s office and is leading Wagner in the polls by 16 points, according to RealClearPolitics.